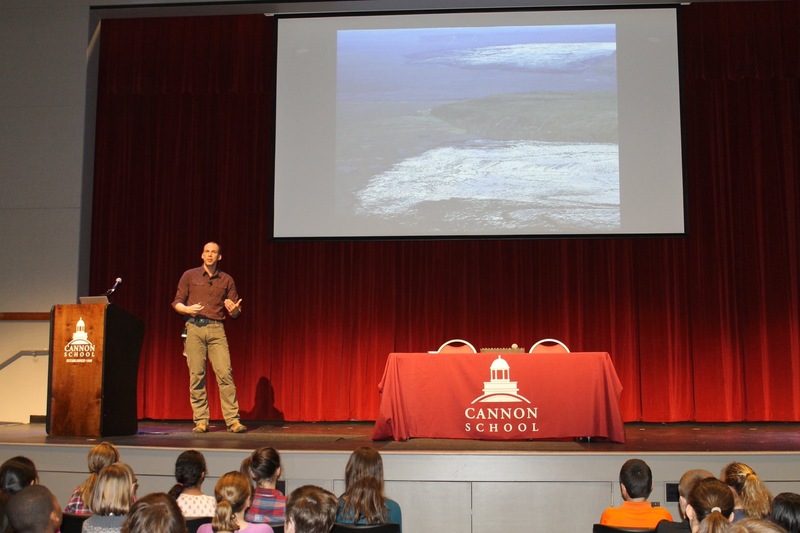 I’ve had a couple of terrific experiences with students over the past few weeks– from teaching a two-week intensive class titled Resilience, Complexity, and Flow at Sterling College–to meeting with hundreds of students at Cannon School in Concord, NC last week. Each of these gave me a chance to have some powerful and important conversations about what it means to be resilient, and how being vulnerable can be a way to become more powerful in the face of a changing climate and changing world. My Sterling class ended with a conversation about perception and the precarity of balancing between self and place. We are always, the students seemed to agree, both within the world and at its margins–there isn’t really any terra firma on which to stand and assess the world, as we are bound to it, ever in flux. This didn’t mean, for most students, that there was no meaningful path forward. In fact, the path ahead seems clearer–in a world already pushing (and even beyond) the limits of social and ecological capacity and sustainability, by better understanding the complexity our world and by embracing our own vulnerability can we begin to build a more resilient future. After my presentation to middle school students at Cannon School, I was peppered with so many questions that we ran out of time! The students were so excited by my experience of running across Iceland and seemed to be looking for ways to connect Climate Run to their own experience of the world, that I could have talked with them all day! It struck me that this was exactly why I was doing this–not only to share my experiences of endurance running and of seeing the effects of climate change firsthand, but to continue the conversation and to share and learn more about ideas of resilience and vulnerability from everyone I talk with–whether that’s a group of a dozen college students, or a room of 75 outdoor enthusiasts at the Green Mountain Club, or several hundred middle schoolers in North Carolina. What I learn from each of these encounters can be just as meaningful and powerful as enduring hour mile after mile of unforgiving Arctic terrain. This is very exciting, Pavel! We’d still love for you to connect with students at our school. Let me know if you’re interested. I would love to Deb! Could you email me some possible dates / times? Deb: Pavel’s message is awesome. There are so many different angles: grit, determination, resilience…and the science too: climate change, geology, topography. He presented to both middle school and high school students. Let me know if you need any help.